I got this idea from a teacher I marked diploma exams with a couple of years ago. I’d love to credit him, but I can’t remember who he is. This is a WCYTWT submission, or as I like to call it, WWDDWT (What Would Dan Do With This). I used it with a couple of classes last year, and they really enjoyed it, but I used it poorly. I did it at the end of a unit on Permutations and Combinations, so the students knew exactly what to do with it. It wasn’t truly a problem, because they knew exactly how to solve it when I gave it to them. I should have used it on day one of Permutations and Combinations, and let them invent the fundamental counting principle on their own. 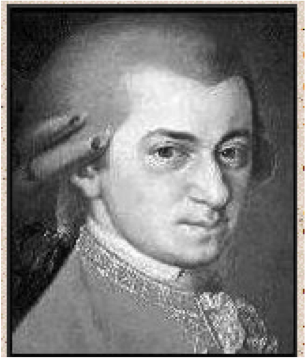 Mozart is credited with creating a dice game, whereby you roll a pair of dice 16 times to select 16 measures to insert into a minuet section, and then a single die 16 times to select 16 measures to insert into a trio section. For example, if you roll a 6 for the first measure, you consult a chart to see what measure number to insert into the first measure of your minuet, and so on. The idea is that no matter what you roll, you always produce a minuet that fits whatever rules go along with a minuet. This site explains it in a little better detail. Mozart’s Dice Game. The drop down menus let the students enter numbers that they roll on dice, so give the kids some dice, and let them enter their rolls. Notice the link below the chart that says “Make Some Music!” Once the students have all entered their rolls, you click here and the newly created minuet will play. There’s even a “Generate Score” link below the media player that lets you generate the score for the minuet they created. My students loved this, and printed theirs off to try to play it on the piano themselves. After the minuet plays, you tell the kids that even though this was written more than 200 years ago, you are pretty sure that nobody has heard the particular minuet the class just created ever before. Ask them to discuss this statement. They’ll say things like, “Why, did they lose the score until recently?” and dance around it until one kid finally asks, “How many minuets could be made in this game?” Then you’ve got them and you let them play around with it. They will invent the fundamental counting principal, determine that there are an incredibly large number of possible minuets, and even create their own interesting extensions. One student even came in the next day with an iPhone app that generates minuets using Mozart’s Dice Game. The only problem with the app is that it only randomly generates minuets, and doesn’t allow you to enter your own rolls. My greatest fear was realized. The site I talk about above is no longer functional. Something about Midi Files, Flash players, and the like. I couldn’t get it to work in any browser. It randomly selects the measures to play, as highlighted below. You can play your own measures by clicking on the un-selected ones, so you could still have your students roll dice and create their own minuet, but you’d have to click your way across the chart. If you can keep time, it’s pretty easy. The vertical columns represent one roll of a pair of dice. So if the first roll was a 2, you’d play measure 96. In the screen shot below, the first roll was 3, the second roll was 6, and so on. Great blog! Sorry I haven’t been here earlier. On the upside, I now have some interesting catching up to do. We are in the process of adding smartboard to our arsenal as well. I’m a little apprehensive – since we haven’t had any training on how to use the darn things. Any hot tips on where to go for direction? So many of our schools put Smartboards into every classroom without offering support to the teachers. Then they assume that teachers will use them and students will be engaged. What I see in a lot of classrooms, though, is a Smartboard being used as an expensive overhead projector or screen for showing powerpoints. There’s really two things people need to learn about Smartboards. First of all, they need to learn the basic “button pushing” and the Notebook software that allows them to use the board. Our technology consultants call this “level 1”. The second, and harder thing to learn, is how to use the Smartboard to enhance lessons (level 2). I think I would start on the SMART website for the basic button pushing. It’s http://www.smarttech.com. Another good site that offers online training and ideas is http://www.teacherslovesmartboards.com. After that, it’s a matter of sharing with other professionals and seeing what they are doing. For you, this may not be so easy, because you’re in a specialized field. Normally teachers collaborate on planning, and share what they have created. You are going to have a more difficult time finding other professionals in your field to share resources with. To me, the real power in a Smartboard is in its interactivity. Find ways to get students involved and using it, and you’ll be on the right track. If you’re the only one who ever touches it, you are not using it to its full potential. I have a project for math class and was wondering if you can use music as a field that uses the fundamental counting principle and mozart as someone who used it? Bre, I’m not sure if music in general and as a broad field could be considered to be a field that frequently uses the fundamental counting principal, but Mozart certainly used it with his dice game. It’s a great example of the fundamental counting principal. I don’t want to speak on behalf of your teacher, but depending on the parameters of your project, Mozart’s Dice Game would very likely fit. Good luck with it.